This Holiday Caravan is 28 feet long and 10 feet wide. The caravan is privately owned and cleaned. It is sited on a cut grass area with free parking by the side. There are two bedrooms - one double (with colour TV/Freeview) and one with two single beds which can be combined to make double. Another double can be made up in the lounge. The bathroom has shower cubicle, toilet and handbasin. 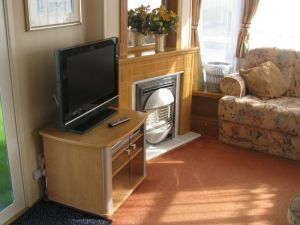 The lounge/diner has ample seating for 6, a gas fire and 26" colour TV with Freeview and DVD Player. The kitchen is well equipped and has gas cooker, microwave and fridge. The Park is surrounded by things to do - Boating Lake and Gardens, Zoo, Indoor Swimming Pools, Gym, Children's Play Area, Tennis Courts, Bowls. Low Season - £230.00 p.w. High Season - £540.00 p.w. This listing for a privately owned static caravan rental has been viewed 21326 times.